For a business, good design can be everything. It’s what defines a company, its product and its community. A well designed company presence can be as important for closing a sale as the salespeople who work at the company. For a small business, design can be intimidating. Many small businesses don’t have well designed logos, websites or advertising because talking to designers, design firms and marketers can be a daunting and expensive prospect. PowerBand Graphics LLC was founded as an approachable design and graphics house. Our goal is to provide affordable, high quality design and web solutions to help local and small businesses compete on any level. We are here to answer questions and create long term relationships with our customers. It’s more than just design, it’s about connecting business owners with the right designer to present their information. It’s about finding the best way to present their message while at the same time removing the pressure and intimidation that can come with trying to find the right graphic design solution. 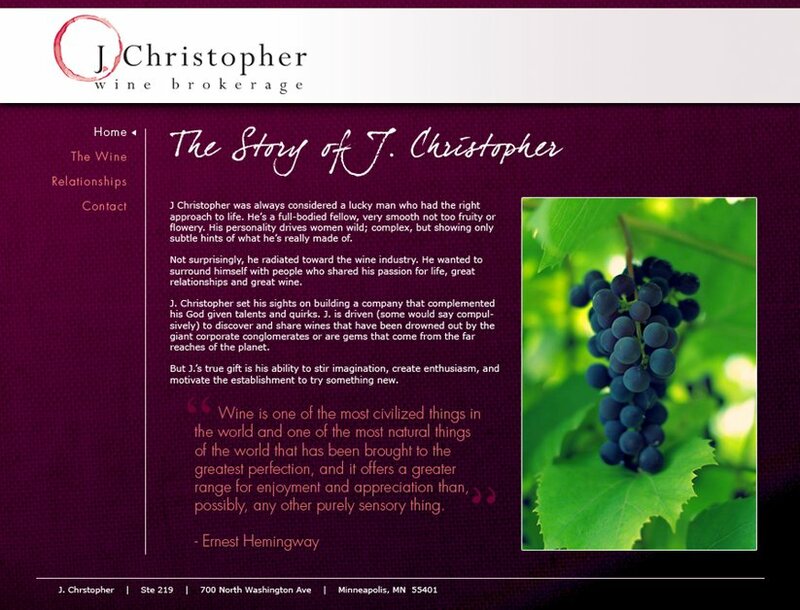 This is a homepage concept for a website design of J. Christopher Wine Brokerage.